NACA staff conduct tests on airfoils in the Variable Density Wind Tunnel. In this historical photo from the U.S. space agency, taken on March 15, 1929, a quartet of NACA staff — from left to right: Eastman Jacobs, Shorty Defoe, Malvern Powell, and Harold Turner — conduct tests on airfoils in the Variable Density Tunnel. (In 1985, the Variable Density Tunnel was declared a National Historic Landmark.) 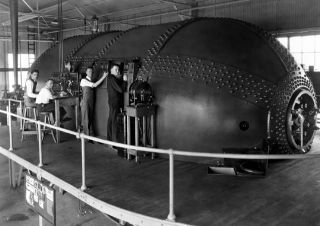 Eastman Jacobs is sitting (far left) at the control panel.